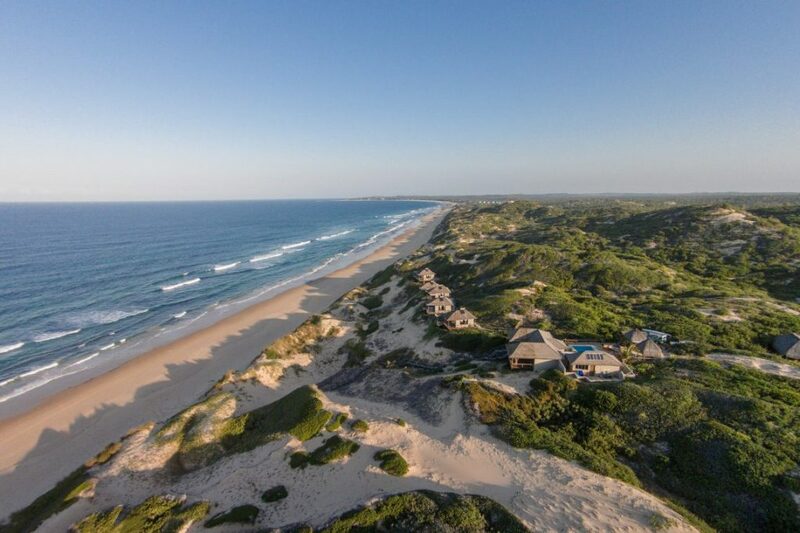 Blue Footprints is a beautiful, self-sustaining eco lodge overlooking the Indian Ocean in the south of Mozambique. We spent a magical few days there in a stilt bungalow perched high on sand dunes, and couldn’t help but feel absolutely inspired by the free-spirited owners Liz and Lisa, and the concept they’ve built. We caught up with Liz to hear more about the story behind it. Tell us about Blue Footprints. Why did you and Lisa decide to build the eco lodge together? Lisa and I initially came out to Mozambique to run a dive centre together in Barra, just along the coast. We’d met when I was retraining to be a dive master, looking to escape a London life that I was deeply unsuited to. Lisa was my diving instructor and soon became a great friend. She persuaded me to ditch my plan of moving to South America and come out to Mozambique to run the centre with her instead. Of course, we fell in love with the Inhambane area. It’s incredible here. We both knew we didn’t want to go back into big city life, so, we decided to trust our instincts and follow our dreams. We found a piece of land for sale on a sand dune overlooking a very secluded stretch of beach with the most amazing views out to the wild Indian Ocean, and decided to just go for it. This was around ten years ago. I also fell in love with a ginger dog called Itch and couldn’t bear to leave him… It feels strange to say we stayed and built a lodge because of a dog, but it’s the truth! Wow. So how did you go about it? There’s something about being surrounded by nature and vast ocean views that makes you believe that anything is possible. And it’s absolutely true! But, of course we had no idea about building a lodge or the challenges we’d face along the way. We’ve honestly poured our hearts and souls into this place, and we hope our guests feel that when they come. In the end, it was an 18-month journey of planning, building and paperwork, fighting fires and a few corrupt officials too. Us and our three dogs building our dream in the middle of nowhere, with absolutely no clue what we were doing. Funnily (and luckily) enough, the two brothers who sold us our land set up a family construction business with the money we’d paid them. So, when it was time to begin building, Manuel and Gerry and their families came back to help us. We literally couldn’t have done it without them, and we’re still very close to them now. We also hand-picked a small team of staff from the local community, who’ve joined us on this journey. We’ve personally trained all of them (tourism is a fairly new concept to the area) and most are related. It’s a true family here! So, you designed Blue Footprints to be an entirely self-sustaining eco lodge. What does that mean in practice? All of our food is sustainable. We catch pelagic fish (tuna, barracuda, essentially everything that isn’t reef fish) right on the beach in front of the lodge. The crayfish, prawns and langoustines come from Tofo, the next town along the coast. The Mozambican government stops people from fishing in the same area all the time, so it’s rotated in seasons and stops over-fishing. All the fruit we eat is literally falling from someone’s tree. It’s fresh and completely organic. We get pawpaws and bananas all year round, there’s mango season around September to January, and then avocado season starts. You can buy a big, fat avocado for 5 meticals (less than 10p!). Our chefs are vegan trained, and we have zero food waste, thanks to people, puppies and pigs! We have our own water supply from our bore hole, so we can drink our own water and minimize our plastic bottle usage. We give our guests flasks to take out with them, and I also head out with the dogs every morning and pick up any rubbish that’s left on the beach by people passing by. When guests stay with us, we like to think it’s more of a reconnection than a holiday. It’s a good place to be. Beautiful and very healthy. What is it about Mozambique that made you decide to build your dream here? Mozambique is an up-and-coming country. There’s real serenity here with peaceful, empty beaches along 2700km of unbelievable coastline. The marine life around Inhambane is absolutely incredible with humpbacks, whale sharks and mantas. It was here that marine biologists discovered there’s a second species of manta ray. That aside, a big draw for us was definitely the Mozambican people. There’s a huge community here and once they accept you, you’re extremely well supported. There are also lots of expat business owners supporting each other. It’s not easy or convenient doing business in Africa. Things can be difficult, but together as a community you can work through the challenges together. There’s a beautiful ecosystem. What’s next for Blue Footprints? We spent much of 2017 rebuilding our lodge after it was destroyed by a tropical cyclone, leaving barely anything behind (thank goodness our solar panels survived – they’re the most expensive thing we have here). Thankfully, the local community showed us lots of support and helped us get back up on our feet. This year, we’re welcoming lots more wonderful guests and have even launched our first series of fitness retreats including pilates, yoga, free-diving and acro balance. They’ve been really popular and we love sharing our little slice of paradise with groups of like-minded people, so we’ll be doing more of these. When we think back to last year… Well, what a difference a year can make! If you’re tempted to experience Blue Footprints for yourself, we’d love to plan an extraordinary trip to Mozambique for you. Book in a free exploratory call here.